Despite the exceptionally cold weather, there was bright sunshine at the end of the bank holiday, and late one afternoon earlier this week two of took advantage of the bright spring skies to visit Beagh Castle on the banks of the Shannon Estuary, close to Ballysteen and north of Askeaton and to enjoy the sunshine. But Beagh Castle no longer has signs that say the castle and the neighbouring, ruined coastgaurd station are for sale, and there are no indications whether the ruined castle and the ramshackle buildings around it have been sold since my last visit. 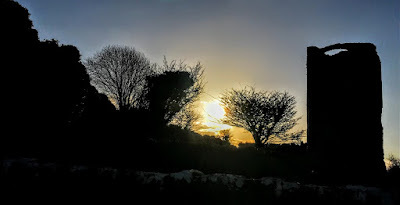 As we wandered around the castle grounds and made our way down to shoreline, at least two couples managed to climb the steps inside the castle ruins and must have enjoyed beautiful views of the sunset from the parapets. Before arriving at Beagh Castle, we stopped for our first visit to the ruins of Beagh Church, atop a small nearby hillock. This church is in the townland of Ballyaglish and is referred to occasionally as Iverus Church. 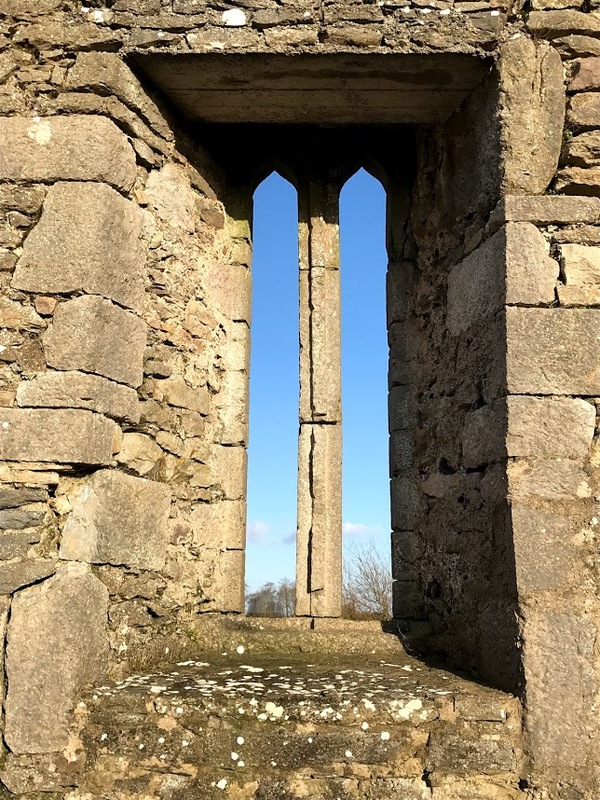 The ruin stands on an elevated site overlooking the village of Ballysteen to the west, and with sweeping views across to the Shannon Estuary. 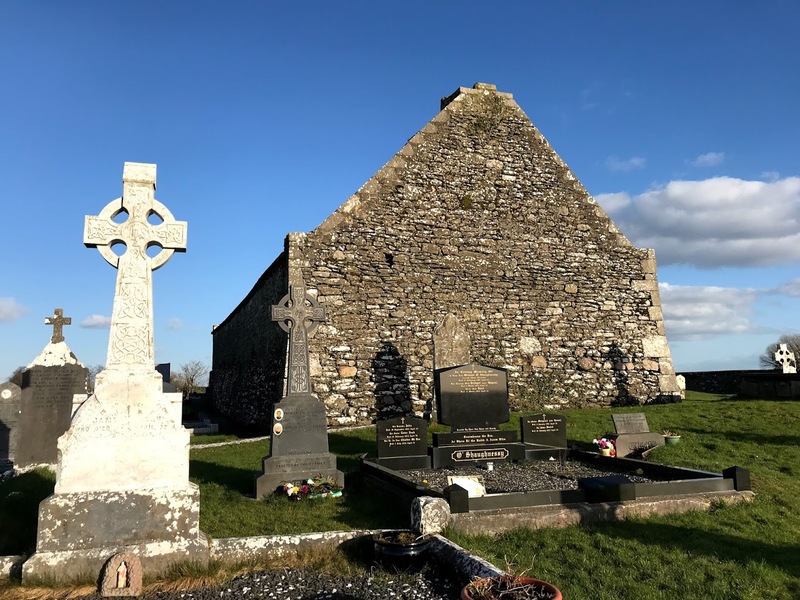 According to local legend, this church was built by the Viking commander Iverus when he first came ashore in Co Limerick, having sailed up the Shannon with a powerful fleet in the year 824. Westropp measured the church as 57 ft by 22 ft. The church has no roof, and the walls with parapets stand about 13.5 ft high. The parapets were described in 1840 as measuring 3 ft in places and 18 inches in others. The walls are made of large and small stones with lime and sand mortar. A major feature of the church is the East Window, which has two ogee lights. There is also a wide doorway with a pointed arch in the south wall. The church was renovated in the 1980s and ruins remain in good condition, with local people taking care of the surrounding churchyard, which has a number of tombs and graves. The oldest gravestone is a headstone dating from 1760 and is to the memory of Dudley Joynt who died on 28 June 1760 at the age of 56. The Joynts were a Huguenot family originally from France who moved to Co Limerick in the 17th century, and William Joynt was sheriff of Co Limerick in 1659. Dudley Joynt’s wife Rose was a daughter of Major Hugh Galbraith of Cappard, Co Galway, who abducted Catherine Persse, a daughter of the Very Revd Dudley Persse, Dean of Kilmacduagh (1662-1700) and Archdeacon of Tuam (1662-1670). Dudley Joynt lived at Ballinacourty or Ballnacourty, near Askeaton, and his descendants first lived in Rathkeale, where they were merchants and tallow chandlers. His descendant, William Lane Joynt (1824-1895), was the founder of the Limerick Athenaeum and is the only person to have been elected both Mayor of Limerick (1862) and Lord Mayor of Dublin (1867). William Lane Joynt was first apprenticed as a solicitor to Matthew Barrington in a leading law firm. The Barrington family lived at Glenstal Castle and founded Barrington’s Hospital for the people of Limerick. As President of the Limerick Literary and Scientific Society, William Lane Joynt proposed the establishment of the Limerick Athenaeum. Two years later, in 1854, he married Jane Russell, the second daughter of John Russell, a leading Limerick merchant, and they lived at 86 George’s Street (now O’Connell Street), Limerick. He was a Liberal politician, representing the Abbey Ward on Limerick Corporation, when he was elected Mayor of Limerick in 1862. He moved to Dublin the following year, and there he was elected Lord Mayor in 1867. He was appointed the Crown and Treasury Solicitor for Ireland in 1869. He took a keen interest in the development of the West Coast sea fishing industry and is responsible for building many piers and slipways on the coastline. He had a summer house in Ballyvaughan, Co Clare, where his name is inscribed in a monument recalling his successful efforts to persuade the local landlord, Henry White, Lord Annaly, to provide a free water supply for the tenants. He died at his house in 43 Merrion Square East, Dublin, in 1895 and is buried in the grounds of the churchyard at Saint John’s Church, Limerick.